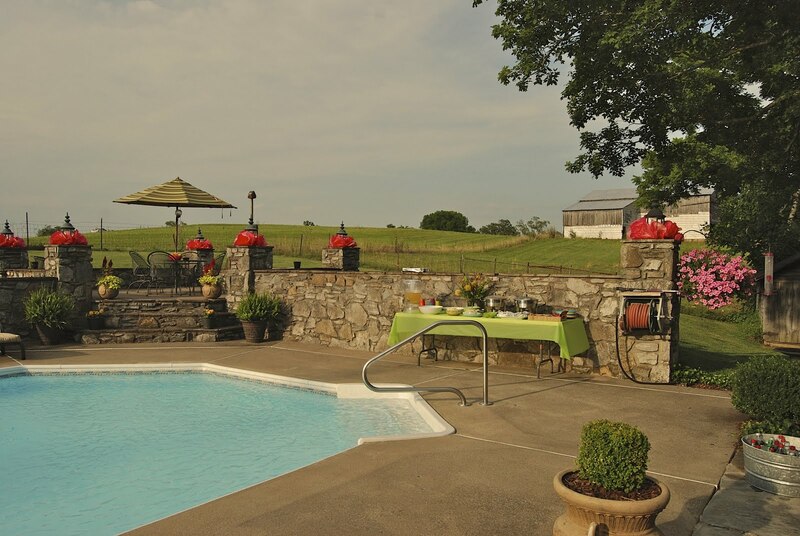 Several weeks ago we hosted our Sunday School class party. We thought a Mexican theme would be fun and that fajitas with all the fixings, chips and salsa, Ginger Lemonade, and Sopapilla Cheesecake Pie would be the menu. I purchased some bright green tablecloth plastic from Party City and some very colorful plastic plates and cups from Sam's. 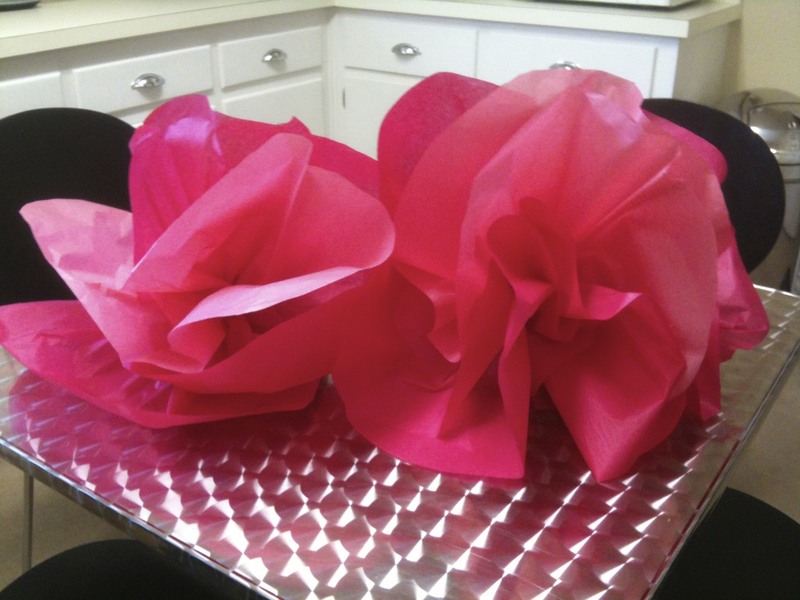 I know it's hard to believe but I already had a large supply of fuschia tissue paper to make lots of large paper flowers. 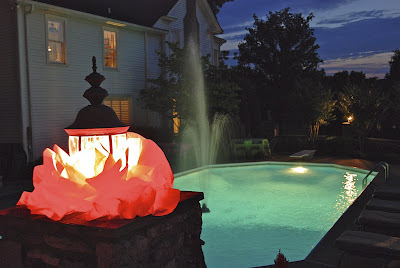 I had Jerry pull out the pool fountain he had given me for my birthday several years ago to add the soft sound of splashing water. All set and ready for the party. 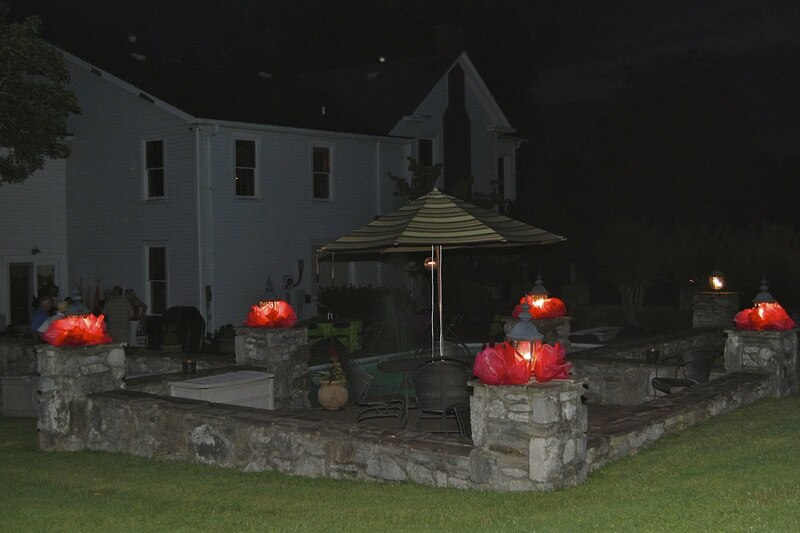 We took this photograph after everyone was gone to show how the lights illuminated the flowers. The setting was the most impressive at dusk, as you can see in the first photograph. If you're hosting the event and want photographs consider designating someone to snap photographs for you. I had a friend jump in and say let me take some photos for you. In fact, Carolyn Barnett, actually snapped the first photograph which is my favorite. I'm thankful Carolyn volunteered to be my photographer for the evening. Along with the tablecloths I found the perfect napkins at Party City. As I was pondering what to do for a floral arrangement, Kroger's floral department came to the rescue. Who knew Kroger would have my inspiration? 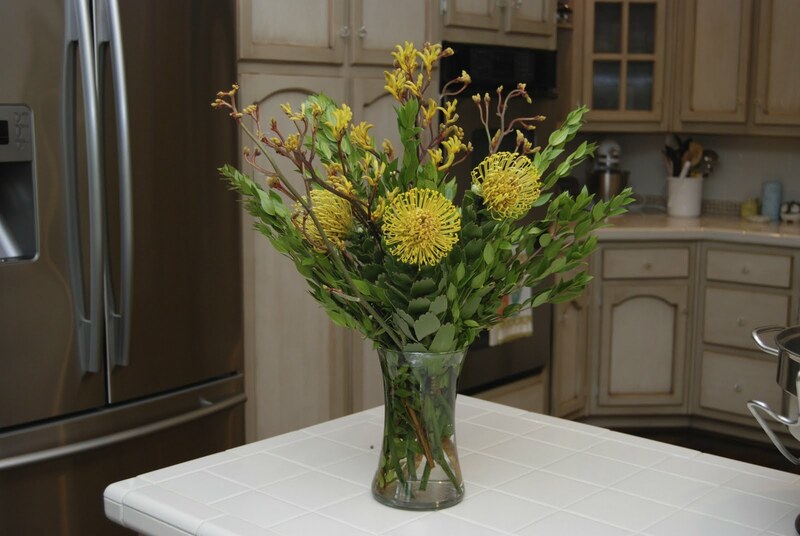 The flowers were sorta of deserty looking and even better news was they were on clearance for $3 a bunch. I purchased four different bunches and I walked out of Kroger with my $12 floral arrangement. 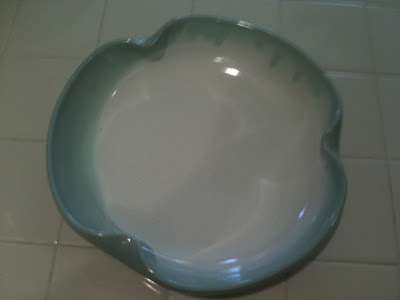 As I was searching my cabinets for containers, I found this super cute bowl that my mom purchased in Japan in the 60's. It still had the label on the back. She tried to sell it in a garage sale many years ago for $2.00, I'm so glad no one purchased it. It's a perfect container for sour cream. These tissue flowers are so easy to make I thought I would share how I made them. 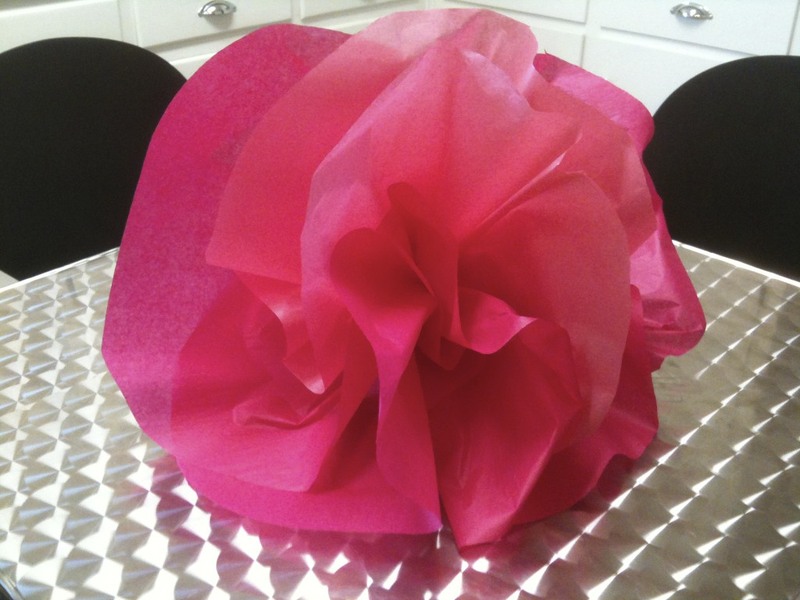 This style flower can be used for Mexican and Hawaiian party themes. And of course, fuschia colored tissue paper will work for either theme as well. Since we have a pool and with stone columns, it was easy to decide where to place the flowers. We have 12 columns and I needed three flowers on each column. So I needed 36 flowers in all. 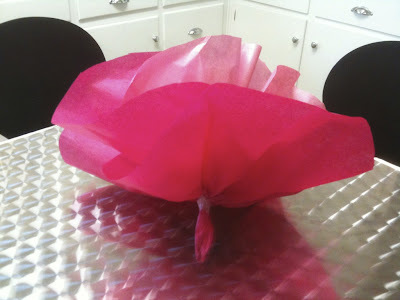 Each flower requires three sheets of tissue paper. First, round the corners on every sheet. 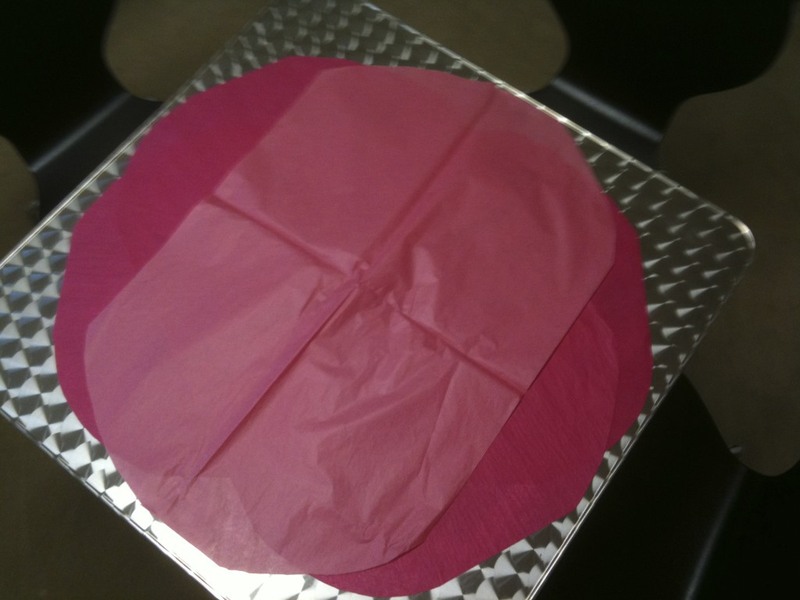 Then layer the three sheets and rotate them to resemble a circle. Next, grab/pinch the center of the three sheets and twist to create a stem and wrap the stem once with scotch tape. Lightly pull on the paper petals to create and shape the flower. And voila you have a beautiful tissue flower. Each flower only takes about 2 minutes to make. 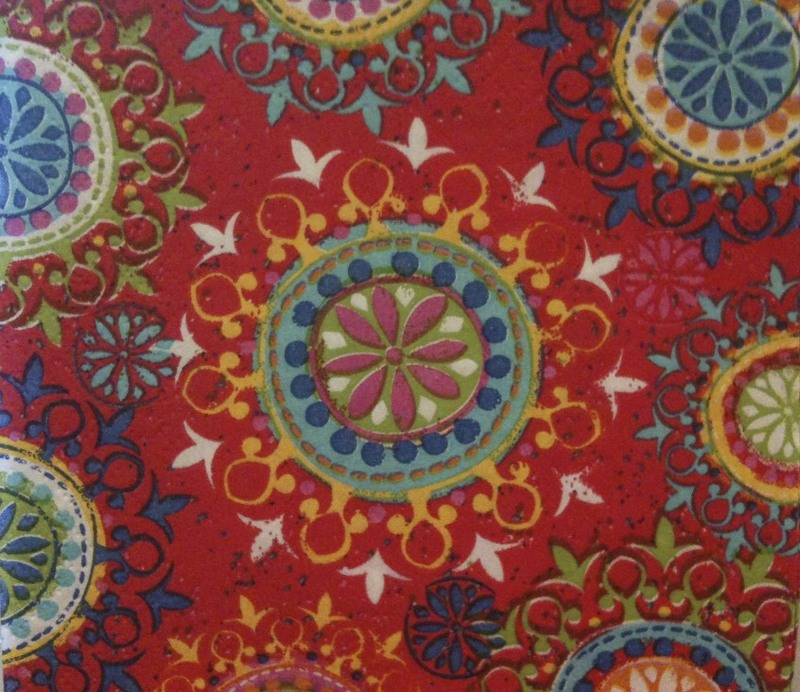 This paper flowers is a Spanish influence. Here in the Philippines we do decorate also with paper flowers. It's very much the same.